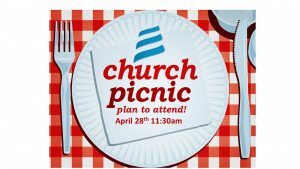 On Sunday, April 28th, we will have a Picnic Lunch here at the church building for the entire church family!!! We are looking forward to sp ending time together as we laugh, eat, get to know each other and build upon our relationships with each other. We will be providing more information soon, but go ahead and make plans to be here on the 28th as we have lunch together! For more information, please contact Kim Johnson – kjohnson@lighthousechurch.net.